This was highlighted in a recent webinar roundtable by The Grocer on ‘Plastic and the Packaging Conundrum’. Led by the Editor ofThe Grocer Adam Leyland, the discussion asked the question: What happens now? How does the industry square away such conflicting requirements to protect, preserve and prevent waste and save the planet from the blight of pollution and litter? The panel featured key figures from the food and drink industry such as Iceland’s Managing Director and Coca Cola’s Head of Sustainability, as well as the CEO of WRAP and the Director of the British Plastics Federation from the packaging sector. There were some key themes covered in the discussion and in this blog, we aim to explore these further to try and determine what the next steps should be. Thanks to Sir David Attenborough’s Blue Planet series plastic is now high on the news agenda. Daily headlines about the ‘plastic crisis’ seem to both reflect and fuel the increased sense of passion and urgency from the public, putting greater pressure on companies across all sectors to do ‘the right thing’ and save our planet from the effects of pollution and litter. But as is mentioned in The Grocer debate, the majority of companies have already been working hard to reduce the amount of litter and its impact on the environment over the last decade. Particularly in recent years, significant developments have been made. According to Recoup’s UK Household Plastics Collection Survey, in 2016 512,475 tonnes of plastic packaging was recycled. This was the result of a combination of factors. The on-pack label recycling scheme makes it clearer to consumers which parts of packaging are recyclable. 99% of local authorities are now collecting plastic bottles and 76% collect pots, tubs and trays. Innovative packaging solutions that use more reusable and recyclable plastics. Given that the UK has a plastic recycling target of 57% by 2020 we clearly still have a long way to go but the reduction of single-use plastic packaging is a global issue and one that we are all accountable for. SEALPAC will continue to invest in the highly-skilled and experienced teams that work within our Research & Development team, to ensure that we continue to develop innovative and more sustainable packaging solutions for our customers, helping to improve the environment for future generations. But change cannot happen overnight. It’s clear from the roundtable discussion that each organisation is working to slightly different targets for reducing the amount of plastic used in their packaging. And we are all dependent upon innovation in material science as well as investment in new technologies. The UK government has pledged £20 million to invest in new packaging technologies at present but further investment will inevitably be required. When it comes to developments within the packaging industry the focus right now is clearly centred around ways to reduce the amount of non-recyclable and single-use plastic used within packaging, in particular, food packaging. As a company, we are committed to contributing to this cause and are constantly striving to develop new and innovative products and applications through our strong partnerships with customers and packaging suppliers. At SEALPAC UK we are passionate about driving the optimisation of packaging technology forward by opening up new opportunities to the industry. 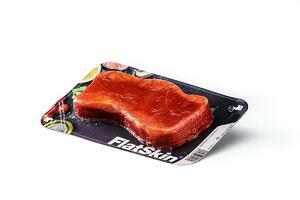 This was the driving force behind the development of our latest piece of packaging innovation - FlatSkin®, a sustainable solution, which uses 75% less plastic than standard food packaging whilst also ensuring that the product remains in its optimum condition. It has been developed to allow customers to easily separate all the components once the product has been consumed, simplifying the whole recycling process for the end user. After the product has been consumed both the skin film and the base film can easily be separated from the card by the consumer to enable 100% recycling of each key component. But as Coca Cola’s Head of Sustainability Nick Brown points out during The Grocer discussion, it’s about more than just the packaging format that’s used. As well as innovation in material science, we also need to focus on making vast improvements to the whole recycling system, in particular, the collection and reprocessing of plastics. A well as being a catalyst for putting pressure on companies to change the amount of single-use plastic they produce; the panel of experts agree that customers are a part of the solution. Current recycling systems within the UK are completely disjointed with different collection policies and levels of capacity in every county - a system that certainly requires a committed customer. Without a joined-up approach to recycling household waste, it’s hardly surprising that there is confusion amongst the general public about what can and can’t be recycled. Terms such as ‘reusable’, ‘recyclable’ and ‘compostable’ are bandied around without clear definitions being given. There is clearly much work to be done in terms of educating people on what kinds of packaging can be recycled and what their role should be before placing items in the recycling but the fact that this can vary so drastically depending on where you live does little to help the cause. It’s clear that to achieve a target like zero plastics to landfill, more work needs to be done to create a more sustainable system for the recycling/reuse of plastics, one where plastic is kept in the economy and out of the natural environment. Systems such as the on-pack recycling label scheme are clearly a step in the right direction. Anything that better educates consumers is a welcome start to the solution and combined with a consistent approach in every local authority, this could make vast improvements. The use of single-use plastic, particularly within the food-to-go sector is a pressing concern as is the use of high carbon and single-use black plastic. New or alternative materials must be used to replace these. One idea which could help to limit the amount of waste sent to landfill particularly in the food-to-go sector is the introduction of a deposit-return scheme within the UK. Although this method is successfully being used in several other European countries, most of those don’t have household recycling collection schemes in place, whereas the UK does. So, whether we should do more to improve our existing recycling system in the UK rather than introduce a new one is currently up for debate. Despite the differences of opinion about the best response required, as is demonstrated by this roundtable discussion, most industry experts agree that taking a collaborative approach is the only real way to resolve the current plastics crisis. There is still a long way to go, but the reduction of the use of plastic packaging is a global issue and we at SEALPAC UK will play our part. Although this is a challenging time to be working within the packaging industry, it’s also a great opportunity and a chance to dramatically reduce the amount of plastic that ends up in the waste stream, at landfill or in the worst case our oceans.